Braille is a very important tool for blind people to have independent access to information and reading. Designed to overcome barriers. However, braille also creates barriers. 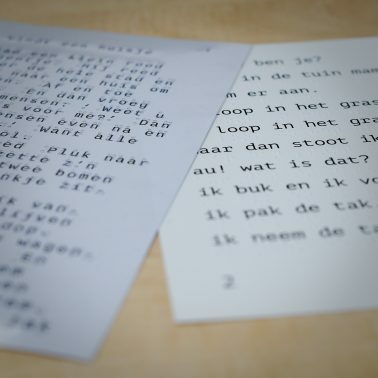 Seeing people usually cannot read braille, which makes communicating in writing difficult. Reading a braille book together with a blind child, for example, is difficult if you can’t read braille. Fortunately, solutions can be found for most problems. In this blog, we want to draw attention to our double print methods. We do not only print on paper, but on different materials, including transparent plastic. The same text can be produced synchronous on transparent plastic and in big letter on paper. If the transparent plastic is on the paper, each braille sign falls exactly on top of the corresponding letter. In this way it is possible to read together. Another way to print a combination of braille and big letter is by placing the braille sign directly under the black print letters. This happens for example with simple booklets for children, produced by the CBB. Especially when learning braille, double print can be an outcome. A teacher can read with the one who reads braille and is able to notice where the pupil gets stuck. A mother can read a book together with her blind child. Double print can be an excellent solution for different situations. For example, to offer a information package that is accessible to everyone. For the blind, visually impaired and sighted. Information should be available to everyone. Double print is one of the many options available with braille. Different situations require different solutions. What a solution is for one is sometimes not a solution for another. customization is therefore important. Do you have a problem that requires a solution? The CBB would like to think along with you! There are many possibilities, more than you might have thought.